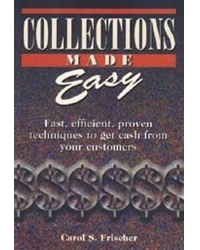 Collections Made Easy was written to help businesses like yours stay in business and gain control of their receivables. It helps you overcome your reluctance to make collection calls and keep better track of who pays when. The book begins by explaining the real reasons people don&apos;t pay their bills and reviews typical excuses you may hear - and the best ways to anticipate and overcome these obstacles. • Make your telephone calls more positive, more timely, and more effective. • Boost the impact of your collection letters (provides sample letters you can pick up and adapt to your needs). • Use Engagement Letters, Service Agreements, Promissory Notes, and Mutual Release Agreements. • Develop a meaningful Client Data Sheet and prevent credit problems with a credit application. • Evaluate your accounts receivable to see where your problems lie before they get out of hand. • Know when to call and how to hire a collection agency or an attorney.